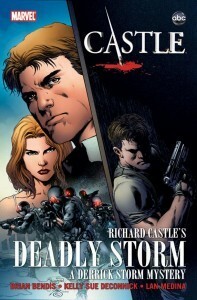 A Marvel Comics Character To Appear On Castle? Yesterday at the ABC day of the TCA Summer Press Tour, ABC President Paul Lee confirmed that Marvel Comics adaptations The Hulk and AKA Jessica Jones are still in development for the network, and could have pilots ready for next year. But before The Hulk and Jessica Jones, we could be seeing another Marvel character on an already-existing series – on the Halloween episode of Castle. “You know, I don’t know if I’m allowed to say it, but we’ve got a really cool storyline with a Marvel character that appears on Castle this year,” Lee said. “There’s one episode, and I’m probably giving away a secret and I shouldn’t because Andrew is going to kill me, with a Marvel superhero character,” he continued to tease. But here’s the question: Could this just be someone in costume, since it is a Halloween episode? Or is Castle really crossing over with the Marvel Universe? Could Richard Castle possibly have a cousin named Frank? Tune in to Castle in October to find out. And if you’d like to see things go the other way around, a Castle graphic novel is coming from Marvel Comics in late September. Thanks to IGN for the initial reports that gave us this news since we couldn’t be there ourselves.